The metrical system is based on all worldwide valid surfaces Dimensions, In addition, in many European countries, some very old measures are still in use. 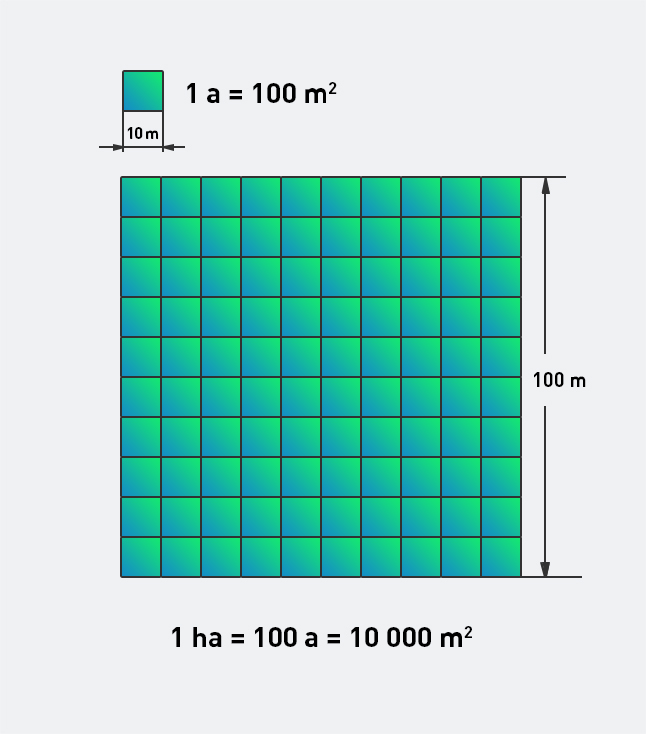 In viticulture in Europe are usually hectares (Hectar), in the Anglo-American area mostly Acres for the size of vineyards common. The old measures used to be based on the use of land. The names or Sizes were due to labor - whether a vineyard dug up, sown or plowed a field, or a meadow was mowed. The area that a man could pierce with a spade on a vineyard in one day yielded a grave. The morning and the yoke were the size of arable land that could be plowed up one morning. A daymah or man's maiden corresponded to the area a mower managed to mow in one day. In addition to the workload, seed and harvest were also used as a criterion for area determination. In the case of fields, it was the amount of seed given by a measure (Metzen, Mutt, Star), in the case of meadows it was the yield unit (Fuder, Heufuder). The area sizes were often different and differed from region to region. They were not exact sizes, but rough approximations. Even within one country, there was no great need for standardization, as basic traffic was handled locally. It was not until the end of the 18th century that precisely measured sizes were introduced on the basis of standard dimensions. Such was the square fathom before the introduction of the metric system. See also other measure-related statements under drum types. bottles. capacity measures. units. wine vessels and Wine production volumes (all wine-growing countries with wine and vineyards). This page was last modified at 26 February 2019 at 16:14.